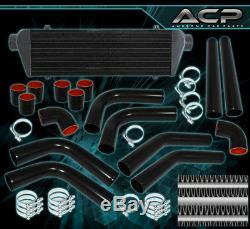 TURBO CHARGER 2.5" ALUMINUM PIPING KIT +28" x 2.75" x 7" FRONT MOUNT INTERCOOLER. 100% Brand New Items, Never Used Or Installed. Universal Custom DIY (Do It Yourself) Piping Kit. Perfect For All Turbocharger / Supercharger Projects. THIS KIT WILL REQUIRE CUTTING / WELDING / MODIFICATIONS. No Installation Guides Are Included, We Highly Recommend To Seek Professional Installation. High Performance Tube & Fin Racing Intercooler Unit. CNC Machined From AL6061-T6 Billet Aluminum With An Anodized Finish. All TIG Welded For Extra Solid Support. Allow More Horsepower At The Same Boost Level and Even More Power At The Higher Boost Level. 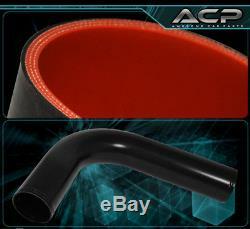 Helps Reducing Engine Inlet Temperature For Better Overall Cooling Of Engine. Intercooler Size: 28" x 7" x 2.75. Core Size: 21" x 7" x 2.75. Inlet / Outlet: 2.5. 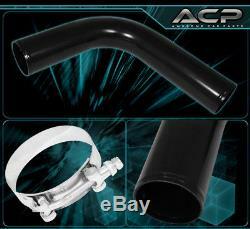 Increases Up To 65% Air Flow Compared To Standard Bent Piping. 2.5 Inlet / Outlet. All Mandrel Bent Piping With Beaded Flared Ends. Pipes Are All 1/16 Inches Thick. Triple Reinforced Silicone Able To Withstand High Heat And Pressure. Will Reduce Vibration Transfer Due To Hard Impact Shifting Or Engine Movement. Reduce The Chance Of Charge Pipe Blow Out By Reducing Movement. X16 Stainless Steel T-Bolt Clamps. Communication is very important and we will try our best to assist all our customers. Questions are answered in the order they arrive. Questions will be answered as quickly as possible. (NOTE: This does not include weekend & holidays). Items may not always be in stock. We do not mark merchandise values below value or mark items as "gifts" - US and International government regulations prohibit such behavior. Tracking numbers are also available upon request. Customer is responsible for making any changes prior to purchasing. BOX , PR , HI , AK , GU , VI , APO , FPO. No orders are processed after a certain time. PO BOX, GU, PR HI, AK, APO/FPO. 8.75% California Customers / 8.25% Texas Customers. All return merchandise must be authorized and assigned with a RETURN AUTHORIZATION NUMBER R. N from our customer service representatives before returning a product. It is the responsibility of the customer to repack the items for the return. Return labels are not given to return these items. We do not offer local pick-ups. Replacements will not be sent until the claim is approved. Instructions are not included unless stated in the description. We are retailers of the parts and are not trained technicians. We can provide minimal support, but we will try our best to help. These items are not suitable for regular driving. User must follow the direction given and any misuse of this product is at his/her own risk. The item "TURBO CHARGER 2.5 ALUMINUM PIPING KIT +28 x 2.75 x 7 FRONT MOUNT INTERCOOLER" is in sale since Monday, September 19, 2016. This item is in the category "eBay Motors\Parts & Accessories\Car & Truck Parts\Turbos, Nitrous, Superchargers\Turbo Chargers & Parts".